Tell us more about your needs. Old World Stoneworks offers three colors, white, cream and buff. Any product can be made in either color. The most commonly chosen color is white. There is a $250 fee for the White. And a $150 fee for the buff. Our standard color is cream. Our cast stone has a “honed limestone” finish. Sealing is highly recommended since all limestone is porous and subject to staining. Any high quality, clear, matte finish stone sealer may be used. Have room that’s particularly vulnerable to drafts? 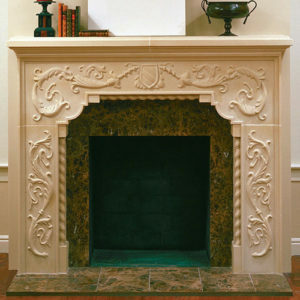 The large firebox of our custom Whitmoore cast stone fireplace adds maximum warmth and the ultimate luxury to any space. Especially sized with larger spaces in mind, you can buy this manmade limestone mantel with confidence and emphasize the beauty of your room. The clean lines create a crisp design that exudes charm. There’s no better way to add a touch of class. Backed by our promise of quality, all of our hand crafted fireplaces are warranted to be free from defect, and can be altered, so long as it retains the integrity of their original design. ©2018 Old World Stoneworks. All rights reserved. All materials embodied herein are protected by copyright and trademark laws. Unauthorized copying of these mantels or drawings in whole or in part will be subject to litigation.